There’s no creature on the face of the earth that has piqued more human interest than our evolutionary ancestors, the gorillas. Gorilla safaris are the best opportunity to observe the majesty of our primate relatives up close and personal, and in their natural habitat. With dwindling numbers and habitat, gorilla safaris where you’re virtually guaranteed a sighing of a habituated gorilla are limited to just 3 national parks in Uganda and Rwanda. Gorilla safaris in Democratic republic of Congo are an on/off affair, and not advised at this time due to security conditions in the country. The cost at the moment is a hefty $500 whichever park you choose to do your gorilla safari in. This price covers your national park admission, guides and armed escorts. Porters are available and should be tipped, but you won’t need to take much extra kit with you unless you’re filming or have some serious camera gear. The round trek from park HQ to gorillas and back can be anything up to eight or nine hours, though in some cases your assigned gorilla family may be only a few hundred meters from where you start trekking – it really is pot luck. A combination of mud, altitude, heavy vegetation and steep hills makes gorilla trekking a fairly physical activity, and one where you’ll need to be determined and relatively fit. When you finally arrive wherever the gorilla family you’re trekking is relaxing you’ll hear your guide make some loud grunting noises to alert them to your presence. From this point you have one hour to stand or sit in awe and watch the gorillas go about their business. They’re surprisingly tolerant of humans, but do show them the respect you would any other wild animal. Gorilla safaris are run year round, and there’s no particularly bad time of year to go. It’s generally easier to track gorillas in the rainy season (April & May and September to November) when they stay at lower altitudes. The busiest time for tourists (and most competition for the precious permits) is December – January and July – August. If you wish to go on a gorilla safari at this time you’ll probably need to arrange it through a gorilla safari operator, and may be charged a premium. Considered by many to be the best place to do a gorilla trek, primarily because of the Diane Fossey/Gorillas in the Mist connection. The surrounding scenery of towering peaks (if you’re lucky and have a clear day) is one of the best in East Africa, and adds to the experience. Tracking here is a gradual climb, and slightly easier than at Bwindi National Park. Your gorilla family is assigned on the day, so there is some flexibility to arrange a shorter or more demanding trek, depending on your fitness level. There are 56 permits for gorilla trekking each day, split between seven families of habituated gorillas. You can arrange the permits direct a fortnight or so before you’d like to see the gorillas with the Office Rwandaise du Tourisme et des Parcs Nationaux (ORTPN) for $500, though this is under review and will probably increase in the near future. If you’re going on a tour or with a group your tour operator will arrange your goilla permits for you – probably with a much shorter notice period but at a price premium. Bwindi was the prime gorilla trekking destination through the late 20th century, in large part because the conflict in Rwanda, but also because the forest there is so specacular. The forest is extremely dense with steep slopes, making any trekking there a challenging affair. There are 48 permits available each day for Bwindi at a cost of $500. Permits are available from Uganda Wildlife Authority or from mid-high end safari tour operators. The Ugandan portion of the scenic Virunga mountains falls within the Mgahinga National Park, on the border with Rwanda and DRC. Trekking through the park is fairly easy, though the higher the gorillas are up the mountain the more strenuous the trek! The downside of Mgahinga is that the habituated gorillas in the park often wander over the DRC border, meaning you’ll be unable to track them. The variable nature of gorilla spotting here makes the park more popular with independent travellers who have more time on their hands, and are happy to take a gamble. There are only eight daily permits for gorilla safaris in Mgahinga, which are available to purchase only two weeks in advance.The $500 permits should be booked in advance Uganda Wildlife Authority and paid for on the morning of the gorilla trek at the park HQ. A gorilla safari experience in the DCR is not for the faint-hearted! Overnight trips to the park from a base in Kivu, Rwanda are possible, but not recommended for security reasons at this time. Officially gorilla trekking was stopped in 2007 after a local militia flare up resulted in some gorillas being killed – presumably to undermine the developing tourist industry. Infrastructure in this part of the DCR is next to non-existent and the rule of law often depends on who has the largest gun. The trek to find gorillas can be a long and tiring one through dense rain forest, so ensure you’re well prepared – strong waterproof footwear and long sleeves and trousers are recommended to avoid scratches from plant life and the ever present jungle ants. Garden gloves may sound silly, but will prove useful when trekking through overgrown brambles and thorns. The hour that you get to spend with a gorilla family when you finally encounter them goes incredibly fast. Make sure you take time out of photographing them to simply watch and admire them. If you’re ill you won’t be allowed to trek to the gorillas, as illnesses can be shared. You’ll need to arrange a doctor’s note for a full permit refund in Uganda, or a 50% permit refund in Rwanda. 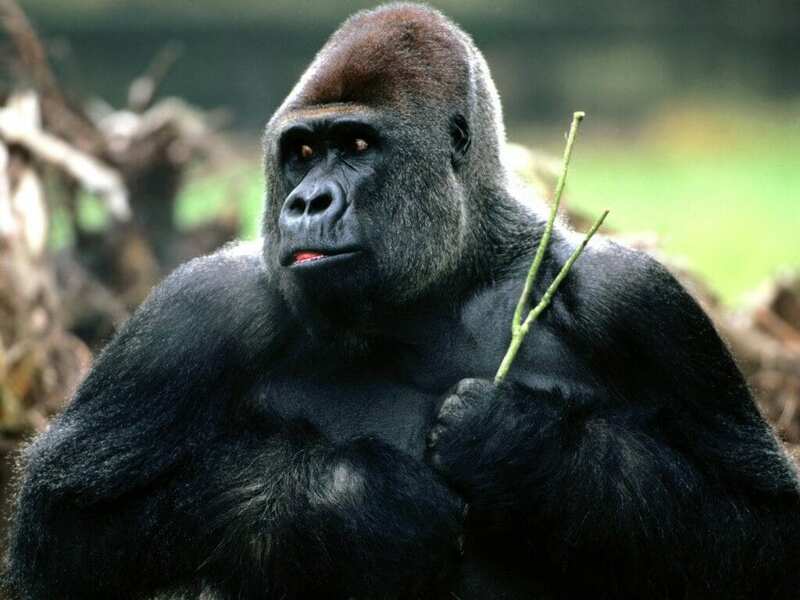 In order not to be viewed as a potential threat you should speak only very quietly when in the presence of a gorilla and don’t make any sudden movemnts. If a gorilla charges at you the advice is to crouch down in a submissive position until they calm down – never turn your back and run!